Looking for a family friendly ski resort? Check out [R438R, Sun Peaks Resort]. The British Columbia ski area caters to families with new ski school programs, amenities favored by kids and a family getaway package. The children's programs at Sun Peaks have gone in innovative directions. Emphasis on meeting the needs of kids led to the creation of the Sun Tots private program. Children ages three through six can take ski lessons, similar to many resorts. But less frequently offered at resorts, kids can learn to shred on a snowboard in lessons for kids ages three through seven. The lessons can be combined with child care. Older kids can take the Sun Kids program group lessons. Sun Kids ski lessons are for children ages six through 12 while Sun Kids snowboard lessons are for children ages eight through 12. 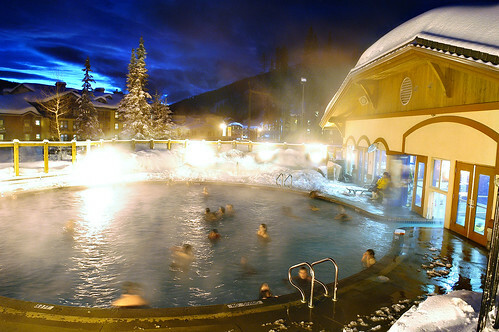 The Sun Peaks Sports Centre features a year-round heated outdoor pool. Photo by Adam Stein. Courtesy of Sun Peaks Resort. The compact, pedestrian-friendly village at Sun Peaks works well for families as no shuttles are needed to hop to the slopes, ski school, daycare, restaurants, cafes or other amenities. After skiing, kids can head to the outdoor heated pool at the Sun Peaks Sports Centre, ice rink, bungee trampoline or the tubing park for more fun. Older kids have their own place to congregate at the Sun Peaks Sports Centre. The Mascon Hangout, just for teens, shows ski and snowboard movies. It also offers X-Box and Wii video games. Admission is free. The village at Sun Peaks provides more than 7,000 beds in a variety of hotels, condos, townhomes and chalets. Photo by Adam Stein. Courtesy of Sun Peaks Resort. 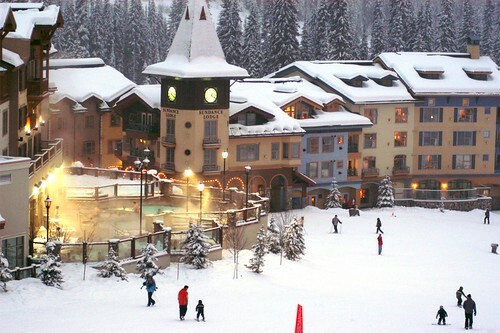 Sun Peaks is offering a Family Weekend Getaway package this winter. It includes two nights of lodging and two days of lift tickets. The package starts at $349 per night for a family. The rate is based on two adults and two children staying in a standard hotel room or studio suite. The package rate is valid Jan. 5 to March 25 and is subject to availability at participating properties. Reservations can be made by calling 800-807-3257 or online here.